Please Note: This review has been updated to reflect the new version of the game, version 1.5, that was released to address a number of comments and feedback from players. The old adventurer sitting at the inn table looks tired, worn, and beaten. He tries to smile, fails, and instead just looks at his mug of warm ale. He says there’s a treasure to be found that he will pay you to find. He’d get it himself, but he’s in no shape to do so and not as young as he once was. He’ll pay you up front and you are welcome to keep all the treasure you find along the way. When you ask him what the catch is, he mumbles something about a crumbling tomb, monsters, and a rampaging ghost. You shrug. A jobs a job and you could use the gold. Time to go make a living the hard way. Baldrich’s Tomb, by Undine Games, is comprised of 1 game board, 50 Treasure Point tokens, 5 Hit Point markers, 24 Scroll cards, 24 Treasure cards, 24 Trap cards, 24 Monster cards, 12 Hero cards (6 Hero Player cards, 6 Hero Player Hit Points cards), 18 Stone discs, 1 Direction disc, 1 Impending Doom disc, 1 First to Land disc, 4 Player pawns, 2 eight-sided die, and 2 black tokens used during game set up. 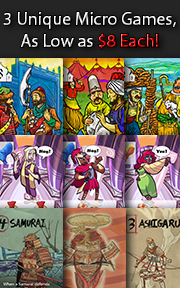 All the game bits and the rules are exceedingly well thought out and creatively designed with colorful illustrations and game board artwork that further strengthen the game’s theme and narrative. Note: Prior to game set up, you will be required to apply stickers to the discs. This will take you about 5 minutes (or less if you want to rush and do a poor job of it). Plan your game time accordingly. To set up the game, first place the game board in the middle of the playing area. 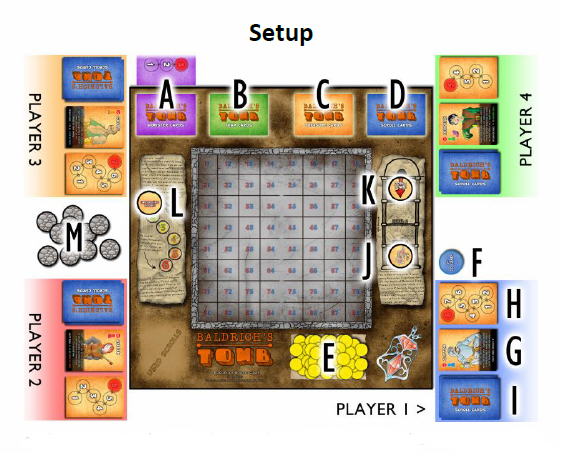 Group the Monster (A), Trap (B), Treasure (C), and Scroll (D) cards into their own decks and shuffle, placing each deck (face-down) on their designated spot on the game board. Collect and set the 50 Treasure Point (E) tokens in their designated spot on the game board, too. However, we found this to be something of a mess, so we put a small cup in that space that contained the tokens. Tidy but unnecessary for proper game play. Find the Monster HP card and place it directly above the Monster card deck with a red Hit Point marker. Second, each player rolls a single eight-sided die. The player with the highest value receives the First to Land (F) disc and is the leader for the first level (the leaders will change throughout the game). This disc is placed in front of the leader until it moves to another player. Third, starting with the leader, a Hero Player card is selected randomly (or, if you prefer, allow the players to select their own card) and places it in front of them in their playing space along with the Player pawn color indicated on the card (G). The associated Hero Player Hit Points card is given to each player and placed next to their Hero Player card (H). One Hit Point marker is also given to each player and is placed on the highest number value of the Hero Player Hit Points card. Then each player is dealt 2 Scroll (I) cards which are placed face-down next to their Hero Player card. These card start the player’s stash where more cards will be placed during the game. The players are welcome to look at any cards in their stash at any time, but should not show them to the other players. Fourth, find and place the Talisman Stone disc face-up on the 4th level (J) space on the game board. Place the Direction disc (which identifies the direction the players are going in the levels) with the “Going Down!” side facing up and on the 1st level (K) space on the game board. Place the Impending Doom disc on the number “1” spot that indicates the round (L). Fifth, randomize the Stone discs and place them face-down next to the game board (M). The Bonus cards should be placed next to the game playing area, face-up, to be claimed by the players who meet the Bonus cards requirements. While there is no designated space for these cards, we found it best to simply place them, face-up, above the Monster, Trap, Treasure, and Scroll cards. Sixth, determine the game’s overall level of difficulty. This should be done as a group. There are three difficulty levels to choose from: Easy, Normal, and Hard. The game play is the same for all three except the number of rounds per level. Easy provides a total of 6 rounds of play per level, Normal provides a total of 5 rounds of play per level, and Hard provides a total of 4 rounds of play per level. Using one or both of the black tokens, cover up the round numbers on the round tracker that are no longer available (L) based on the difficulty level selected. Game set up is now complete. Time to go explore! Before the players can start exploring a tomb level, the current leader must set it up. This is done and repeated for every level. 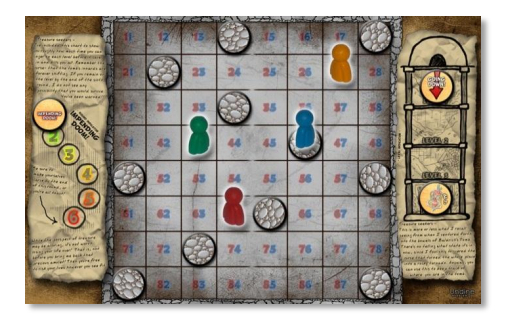 The leader collects the Exit Stone disc and 10 random Stone disc (11 in total, leaving 6 not in play) and places them randomly, face-down, on the tomb floor grid in the middle of the game board. The leader should not know what lurks under the Stone discs and nor should the other players. The only rule for Stone placement is that no two stones can be adjacent to each other. The “best” way to place the stones is to make sure they are as evenly distributed as possible. Now all the players, starting with the leader, place their Player pawns. This is done with each player rolling both eight-sided die, one at a time. The first value rolled by the eight-sided die indicates the red numbers on the tomb floor grid. The second value rolled indicates the blue numbers on the tomb floor grid. The player will place their Player pawn on the grid space that has those two exact numbers. If two or more players will be located on the same place, simply re-roll, as players can never occupy or be in the same space as each other, ever. There simply isn’t enough room in the tomb and all the adventurers have personal space issues. Starting with the leader, with turn order going clockwise, each player will now explore the tomb level looking for the exit. Remember that the tomb is falling apart around them, so this processes must be done quickly. Along the way, they might find a treasure or a monster. Regardless of what the players might or might not find, they only have 6 rounds to do it. A single round is completed when all the players have had a turn. Once the sixth and final round is completed for that tomb level, any player who has not yet exited is killed and their broken body is dragged by the party to the next tomb level where they will be resurrected. On a player’s turn, they will have a chance to move on the level and explore. The number of spaces a Player’s pawn can move is indicated on the Hero Player card. Movement is up or down, never diagonal, and each space moved reduces their total number of movement left by 1. Players should review their Hero Player cards before and during movement as some Hero Player cards have a bonus that can be used. Note: If the Player pawn starts on a Stone disc, the owning player can still move, but must first reveal the Stone disc underneath. When a Player pawn lands on a Stone disc, the player now flips it over to see what is lurking under that stone. This is, for the most part, a very good idea because under one of these stones is the tomb level exit. But, as previously mentioned, other things live under those rocks, too. The rest of the player’s turn is based on what is found under that rock. If the player finds a treasure chest under the stone, they are awarded with one Treasure card which they place in their stash. The player may now continue their turn as long as they still have movement left to spend. The Treasure cards are worth points at the end of the game. The Treasure card stays with the player for the duration of the game unless the player dies. If the player finds a scroll under the stone, they are awarded with one Scroll card which they place in their stash. The player may now continue their turn as long as they still have movement left to spend. Scrolls are very powerful. They can be used at a later time to give the owning player a one time advantage. The player can use their scroll whenever they choose and if possible based on the Scroll card’s description. They need not use it on their turn. Players can even offer to use the power of the scroll on other players, but for a price. For example, if another adventurer is about to be eaten by a dragon, another adventurer could shout from across the tomb floor, “Hey, I’ve got a scroll that will save your life, but it’ll cost you!” Once a scroll is used, however, it bursts into a bluish magical flame and is destroyed (in other words, discarded for the duration of the game). Since scrolls are so very useful and strategic, it is highly recommended that all players keep whatever scrolls they have gathered safely hidden from other players. If the player finds a trap, the will draw a Trap card and read it out-loud, following any instructions on the card. Traps end a player’s movement and turn. Traps are kept in a player’s stash as a reminder that they should be more careful and also to be brought out later as a conversation piece. Some traps, however, have lasting effects. These Trap cards are placed next to the Hero Player card and are active until they wear off. At which time, they are placed in the player’s stash. If the player finds a healing fountain, their hit points are immediately recovered. The Healing Fountain disc remains revealed for the duration of the level. Any player who stops on or passes over it while on the level will also have their full hit points restored. Refreshing! In the unfortunate event of surprising a monster under a stone, the player now draws a Monster card and enters into multiple bouts of combat. Monsters end a player’s movement and turn…possibly their life. Combat is always 1-on-1, although another player can offer (for a price) to help the player out with a scroll or two. The monster always attacks first! An opponent rolls for the monster (to make it interesting), using one of the eight-sided die. The monster card will show what value must be rolled or higher for the monster to successful hit the player. 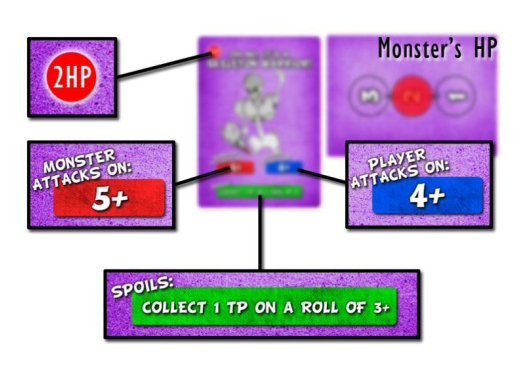 If the monster successfully hits, the player reduces their Hero Player Hit Points by 1. If they miss, nothing happens. The player with the hero who is in combat now rolls their eight-sided die. On the monster card will be a listed value that must be rolled or higher in order to hit the monster. If the monster is hit, the monster’s Hit Points are reduced on the Monster HP card. If they miss, nothing happens. Players should review their Hero Player cards before and during combat. Some Hero Player cards have special abilities that will influence the die rolls during combat! Combat continues until either the monster or the player’s hero falls to the floor, dead. If the monster dies, the player takes the card and puts it in their stash and also receives whatever spoils the monster’s now decimated corpse provides. If the player dies, the Monster disc is flipped back over to show the stone side and the monster is placed at the bottom of the Monster deck. This Monster token can be revealed by another player or the same player (if they are looking to settle a grudge) . If the player finds the exit, they quickly use it or stick around to do some more exploration. If the player chooses to use the exit, the Player pawn is removed from the board for the duration of the tomb level game play. The first player to find the exit is awarded 1 Treasure Point token, but they are not forced to use the exit to receive it. Once the exit is found, it is open to all players. Note: Once flipped over, all revealed stone discs are left on the Tomb floor. Players can pass through (but not activate) Treasure and Scroll discs and use the Exit disc whenever they land on it. Revealed Monster and Trap discs can never be traveled through or stopped on. Either through unlucky combat or not being quick enough to exit the Tomb level by the end of the round, a Hero Player will die. Luckily, this game is set in a fantasy world which means that resurrection is the next logical step after meeting the Grim Reaper. But, there is a cost for such services. When a Hero Player’s hit points are reduced to zero, they are immediately resurrected. If there is still time left to explore the tomb level, the Player pawn is placed back in the tomb (rolling for initial placement). If they were squashed, they are magically whisked away to the next tomb level. The cost of this miracle is half of the player’s total treasure (with the player always getting the smaller half) and the loss of the Talisman if they currently posses it. The cost is paid by discarding Treasure cards and Treasure Point tokens. Lost Treasure cards and Treasure Point tokens are placed on the game board spot with the rest of the yet unclaimed Treasure Point tokens (now you see why we used a cup). Once all the players leave a tomb level or at the end of the 6th round, the players will continue to adventure either going down or up. The First to Land disc is passed to the next player in clockwise order who is now the new leader, the tomb level indicator is adjusted, and the round indicator is reset. The leader should then rebuild the tomb level as described above. If the players have reached the 4th level of the tomb, the leader grabs the Talisman disc and adds it tomb floor with the rest of the Stone discs. Continue to do this until the players have exited the tomb. At the end of the 7th level, the players have traversed the entire tomb, starting at the first level, venturing all the way down to the fourth level, and then back up again to the first level to exit the tomb. All the players now count the number of Treasure points by counting their Treasure Point tokens and the treasure values on their Treasure cards they have claimed throughout their adventure, along with any bonuses from other cards. The players should also add the points earned from the Talisman disc. The player with the most points wins the game and buys the first round of strong ale at the closest inn or tavern for their adventuring party! In the event of a tie, the players should hold a grudge towards each other for a good 5 minutes or so and then get over it. 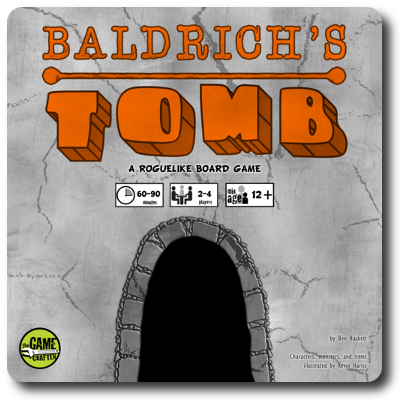 To learn more about Baldrich’s Tomb and read the complete rules, see the game’s web page. I like games where the players get to explore the world or scenario the game board creates. I can’t help it; it’s the dungeon plunger in me. My little geeks are the same and we’ll spend a lot of time creating adventures for us to play, be it with games or action figures. We like the surprises, having to react to new situations, and the feeling of discovery. This game, just based off of what is in the rules, provides us the exploration experience we enjoy. My little geeks do not have the stamina yet to take on a full campaign of Descent and my copy of HeroQuest is really showing its age as of late. In short, I need an alternative that is playable with my little geeks and provides a level of exploration that satisfies our exploration itch. I have high hopes that Baldrich’s Tomb, which reportedly plays in less than 2 hours, will fulfill this need in my happy household of geeks. Teaching the game to my little geeks did not take long. My 5-year-old was mostly concerned with the card reading (which I told him I would help him with) and my 8-year-old was totally focused on the combat. It was the combat rules and flow that was given the most attention while I educated my little geeks on how to survive the tomb. Both little geeks agreed to help each other if they could with their cards, to which I praised them for their eagerness to help, but also reminded them that only one player could win. This made them pause, rethink their earlier comment on helping each other, and then sly smiles began to appear on their faces. After answering any questions they had and demonstrating one last time how combat worked, I asked my little geeks their thoughts on the game so far based on what they had learned. My little geek heroes are ready to go and optimistic about the game so far. Let’s play and see if it lives up to our expectations or should be left under a rock. My little geeks did exceedingly well, but this is not a terribly complicated game, either. Reading, as it turns out, is a must for proper game play as it allows the players to be much more strategic with their offers of help. This became apparent after the fifth round of combat when my 8-year-old nonchalantly suggested we pay him a lot of treasure for his assistance. My 5-year-old wanted to do the same, but couldn’t benefit from proper timing because he couldn’t read his cards. Keep in mind that I helped him with the reading, but that’s not really the same thing. As such, we cannot recommend this game to little geeks who are not yet able to read. Knowing what you have and what your opponents need goes a long way in this game and makes it a lot of fun. 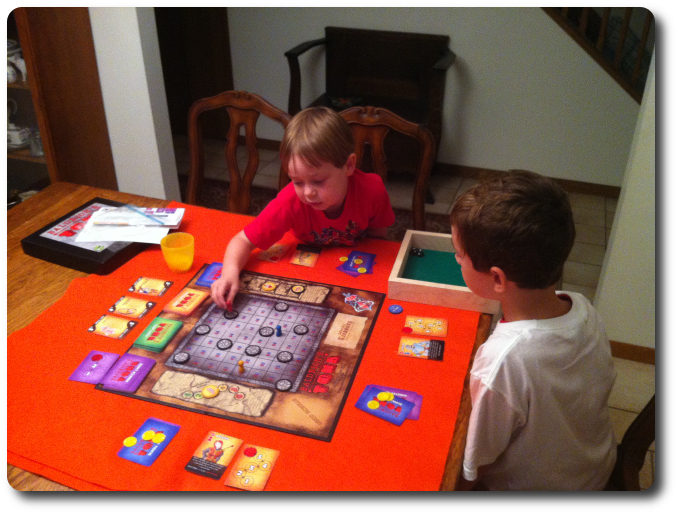 Both of the little geeks highly enjoyed the game’s feel, artwork, and game play, eager for more after each level was completed. Parent Geeks really liked playing this game with their family and their peers. It is relatively light and casual, but still provides a fun dungeon exploration experience. Because of the heavy theme, however, it was not well-loved by the non-gamers who had little to no interest in fantasy. While it is certainly not necessary to be a fan of the fantasy genre to enjoy the game, Baldrich’s Tomb is very tightly entwined with the thematic elements of fantasy dungeon exploration. For those who simply don’t care about that type of story, the game did nothing to grab their attention. One non-gamer said, and this really made me laugh, “exploring dungeons and finding magical treasure just sounds boring to me.” Ha! The new version of the game has removed the roll-n-move game mechanism the Gamer Geeks disliked. As such, the Gamer Geeks no longer had anything negative to say about the game and found it to be a fun and light adventure/exploration dungeon game. My little geeks are doing great, having finished the first level and now taking on the second! Gamer Geeks, this is a game you’ll appreciate and welcome at your gaming table, even more so now that the roll-n-move game mechanism as been removed. Everything about the game is top-notch and the level of strategy and tactics is deep enough to keep you engaged. The repetitive nature of the dungeon exploration could drain your enthusiasm, but each level is always random, making what you find and where different each time. Adjusting the difficulty of the game puts a great deal of pressure on the players and you’ll feel a little panicked when you realize you are running out of time to escape. Baldrich’s Tomb is a smartly designed game and you’ll have no problem recommending it to players who are looking for a semi-cooperative dungeon exploration experience. Parent Geeks, this is a fantastic game to play with the family and friends. The semi-cooperative element is a lot of fun to play off of as all the players are working for their own victory but still most lean on each other for help. Knowing when to play the cards on your own character is just as important as knowing when to offer cards to your opponents. 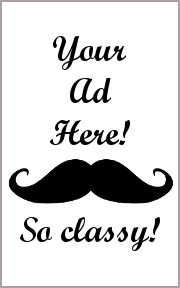 This adds an entertaining auctioning and bidding element that results in some interesting trades and promises of favors. It will be clear to all that no player can do it themselves, but there is little incentive to share in the glory of victory. The time pressure to explore and exit each level also adds growing tension and excitement to the game play. The end result is a very worthwhile game that provides the players the ability to be as cooperative, tactical, and strategic as they like. Child Geeks, this is a really fun dungeon exploration game that will keep you guessing what is under each stone and gritting your teeth in excitement and apprehension as you flip over the discs to reveal what lies underneath! Monsters? Treasure? Who knows? But even if you find the exit and safety to the next level, you won’t want to take it right away. Each level offers new opportunities for powerful items and riches, but watch the number of rounds you have left! Exploring is fun, but don’t get caught in the tomb when the roof collapses! With the changes to the game in version 1.5, the Gamer Geeks now have no reason to turn their nose up to it and have approved it. The game is much more strategic now and can be very challenging. The level of difficulty modification was a brilliant stroke and removing the need to roll dice to move put a lot more power in the players’ hands. If you are looking for a very well written, semi-cooperative, fantasy dungeon exploration game with game play that allows for (but does not require) strategy and tactics, do seek out a copy of Baldrich’s Tomb. It is a game well worth finding.